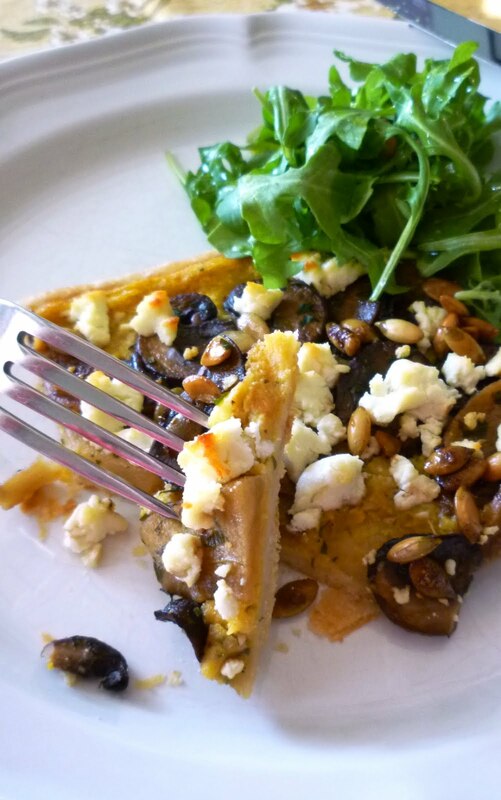 Over the years I have posted a lot of recipes for savory tarts. A tender, buttery crust makes an admirable blank canvas for the products of each passing season. Whether a custard-based, quiche-style tart...or a free form galette...or a simple flat crust topped with cooked vegetables...I love them. ...my preferred squash for this tart. This week I will be teaching a class on winter squash and sweet potatoes. One of my favorite ways to use squash happens to be in a tart...and I will be including a tart in this class. Most of the time when I put squash in a tart, I leave it in slices or chunks that are roasted (or sautéed) before they are put into the crust. But this of course isn't the only way to present it and this time I will be turning the squash into a purée—and smearing it onto a flat rectangle of dough where it will act as an edible (and delicious) glue to hold all of the other toppings in place. 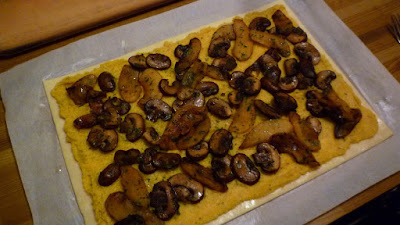 I have posted a couple of other examples of this style of tart...using ricotta instead of squash puree as the "glue." 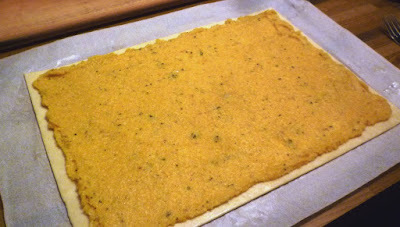 Both the ricotta and the squash (reinforced with an egg yolk) do a great job of holding the other components in place. I particularly like using the squash though. When making such a thin tart, you need to get a lot of bang for your flavor buck in the individual components...and the squash adds a lot of flavor. It is also the perfect counterpoint to the savory mushrooms and sweet tart apples that make up the rest of the topping. 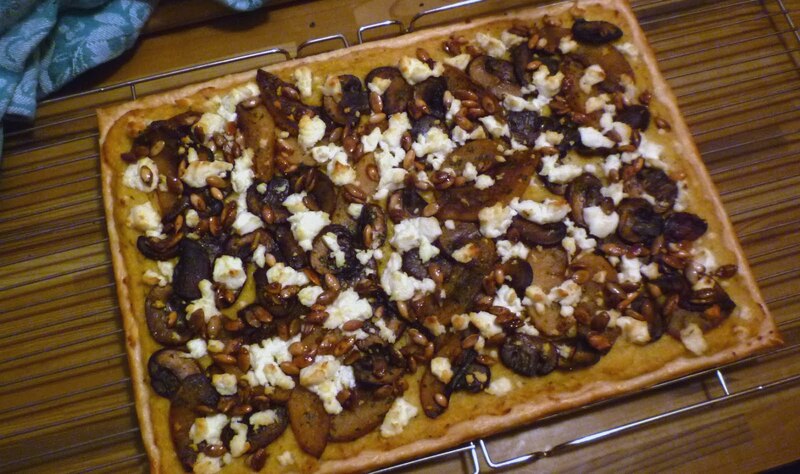 If the combination of mushrooms and apples strikes you as odd, I encourage you to try it in this tart. I think I first encountered this combination in a traditional chicken dish from Normandy. The dish—Poulet Vallée d'Auge—is a classic French sauté of chicken cooked in stock, cider and cream...with mushrooms and apples. Every time I eat it I am amazed by the subtlety and balance of this pairing. Both the apples and the mushrooms are enhanced by it. The dish would not be the same if it were garnished with just the apples...or just the mushrooms. It is the same with the tart. 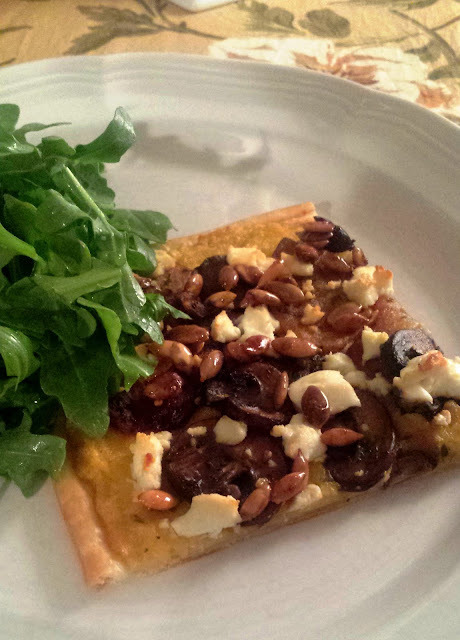 With a small green salad this tart makes a wonderful light dinner...or satisfying lunch. 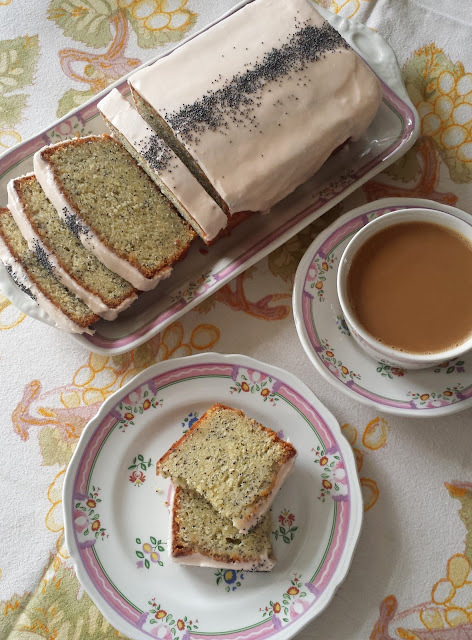 But since we are on the verge of our annual holiday party season, I have also included instructions at the bottom of the recipe for rolling the crust and building the tart in such a way that you can cut small squares that make a perfect finger food. Since all of the components (the crust, squash puree, sautéed apples, sautéed mushrooms and candied pepitas) can be made ahead, it would be the perfect thing with which to greet your Thanksgiving guests. Simply make the components at your leisure in the day or two preceding the feast. Then, on Thanksgiving morning, build the tarts and place them on a sheet pan in the fridge, baking them as oven space allows, and as close to the arrival of your guests as you can. Let the holiday cooking and feasting begin. On a lightly floured surface, roll the pastry out into a thin (1/8- to 3/16-inch thick) rectangle that measures at least 10- by 14-inches. Place on a parchment-lined baking sheet and chill for at least 30 minutes. 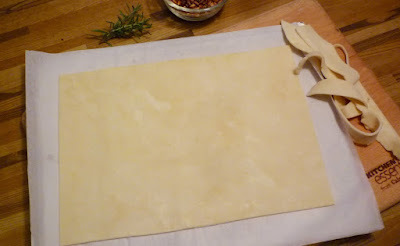 Before baking trim the pastry sheet to a 9- by 13-inch rectangle. Prick all over with a fork. Beat the egg white until foamy and loose. Brush the whole surface of the pastry with the beaten egg white and return to the refrigerator until ready to use. In a small sauté pan, melt the butter over medium heat. Add the shallots, garlic and rosemary and cook until very tender and beginning to caramelize. Let cool. In a medium-sized bowl, combine the squash purée, Parmesan, cooled shallot mixture and yolk. Season to taste with salt & pepper. Set aside. Peel, quarter and core the apple. Cut each quarter into 5 or 6 lengthwise slices (about 1/4- to 1/3-inch thick). Sauté the apples in the butter until they are golden and just tender. (Choose a sauté pan—preferably non-stick—that is just large enough to hold the apple slices in a snug single layer. Start over medium-high heat, letting the butter melt and waiting to add the apples until the foam subsides. Toss/turn the apples occasionally and reduce the heat if the apples are browning too much/too quickly.) Set aside. If the apples were sautéed in a non-stick pan, wipe out the pan and set it back over high heat. If not, set a non-stick sauté pan (one that is just large enough to hold the mushrooms in a snug single layer) over high heat. When the pan is hot, add a tablespoon of olive oil. Add the mushrooms. 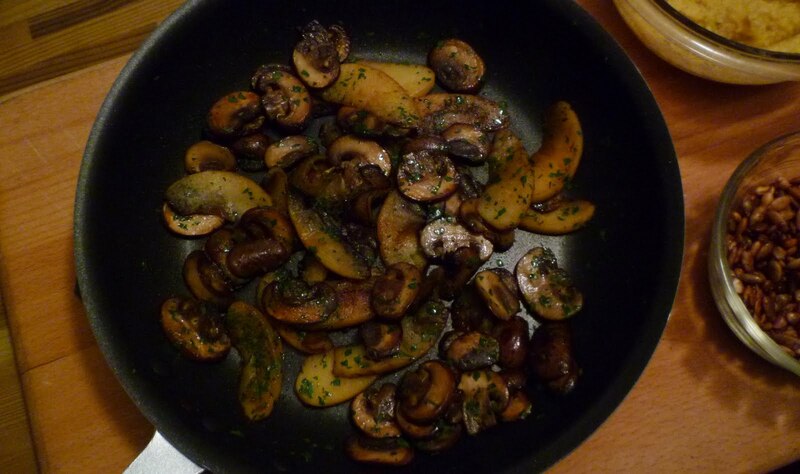 Sauté until the mushrooms start to brown—about 2 minutes. Add a good pinch of salt and continue to sauté, reducing the heat if the mushrooms threaten to burn...but still maintaining an active sizzle, until the mushrooms are tender and browned...about 5 minutes total. Remove from the heat and add the parsley. 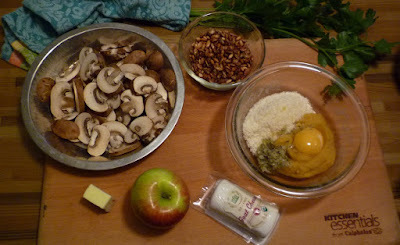 Transfer the mushrooms to the plate with the apples. Fold the apples and mushrooms together. Season to taste with salt & pepper. When ready to bake the tart, preheat the oven to 375° and adjust the rack to the lower third of the oven. While the oven heats, build the tart. Spread the squash mixture over the chilled crust, leaving a half inch border of crust visible all the way around. Scatter the apples and mushrooms evenly over the squash. Bake the tart on the lowest rack until the cheese is tipped with gold and the edges and bottom crust are golden brown—about 25 to 30 minutes. 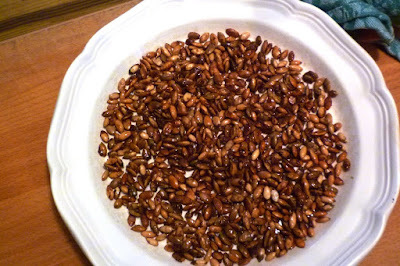 Slide the cooked tart onto a wire rack and scatter over some of the candied pepitas, pressing lightly if necessary to help the seeds adhere to the cheese. Cut and serve warm. Serves 4 to 6 as an appetizer or light entrée with a salad of baby lettuces or arugula. 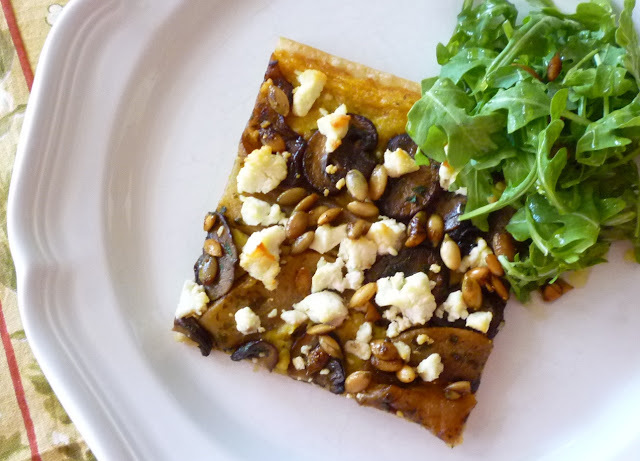 Variation: If you would like to make this tart into small passed appetizer portions, instead of cutting the sheet of dough into one large rectangle, cut it into three 5- by 9-inch rectangles. Top the smaller rectangles exactly as you would the large, using a third of each of the components for each smaller rectangle. Bake as for the large. To serve, cut each rectangle in half lengthwise and then crosswise four or five times to make 8 to 10 small rectangles out of each tart. Because each small rectangle will have been cut from the edge of the tart, each piece will be more stable and it will be easy to pick up with the fingers (you will have a total of 24 to 30 rectangles from the whole recipe). Candied Pepitas: Place 1/2 t. fennel seed and 1/8 t. coriander seed in a medium sauté pan and toast over medium heat. When fragrant, transfer to a plate to cool. Grind in a mortar and pestle. In a small bowl, combine 1 T. sugar, the toasted fennel & coriander, 1/8 t. cinnamon, a pinch of cayenne and a generous pinch of salt. Melt 2 teaspoons of butter in a medium sauté pan set over medium heat. 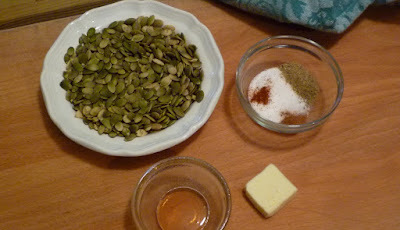 Add 1/2 c. raw pumpkin seeds and toss to coat in the butter. Sprinkle the sugar mixture over the nuts and toss to coat. Continue to cook, stirring and tossing until the pumpkin seeds are popping and lightly colored. Remove the pan from the heat. Wait 30 seconds. Drizzle a teaspoon of honey over and toss to coat. Spread the nuts on a plate to cool. To Roast a Winter Squash for a Purée: Preheat oven to 375° to 400°. 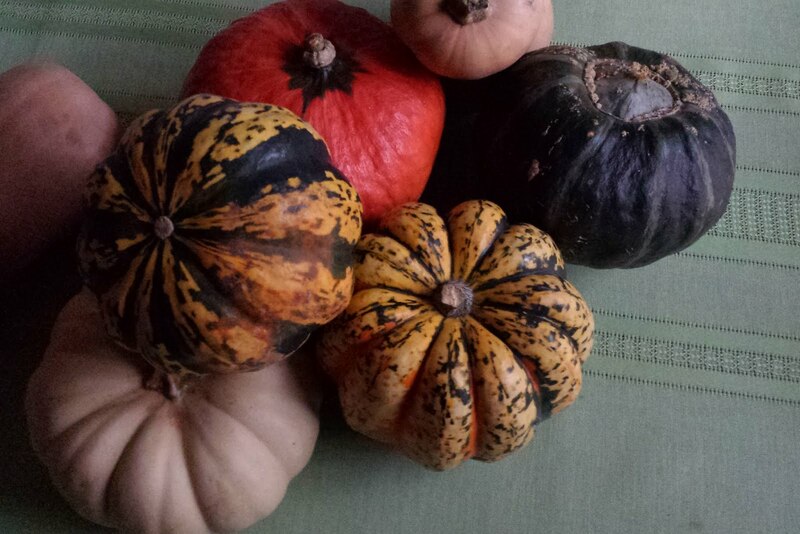 Halve the winter squash. Scoop out the seeds and discard. Place the squash on a baking sheet and brush with olive oil or melted butter. Season with salt and pepper. Place the squash in the oven and roast until fork tender and caramelized in spots—about an hour. When the squash is cool enough to handle, scoop the flesh away from the skin with a spoon. Purée the flesh in the food processor or pass through a food mill fitted with the fine disc. A 2 pound squash will produce a scant 2 cups of purée, or about a pound. Depending on the desired use of the purée, the butter or oil with which the squash is brushed prior to roasting may be augmented with any number of things—honey, molasses, maple syrup or balsamic vinegar—alone or in combination. If you prefer that the squash not caramelize during the roasting process, either cover with foil or oil the pan, add a splash of water and roast the squash with the cut surfaces down. Combine the flour and the salt in a medium-sized bowl. Rub the butter into the flour until the mixture has the look of cornmeal and peas. Drizzle 3 T. ice water over the flour/butter mixture. Using your hands, fluff the mixture until it begins to clump, adding more water if necessary. Turn the dough out onto a counter and form into a mound. Using the heel of your hand, gradually push all of the dough away from you in short forward strokes, flattening out the lumps. Continue until all of the dough is flat. Using a bench scraper, scrape the dough off the counter, forming it into a single clump as you do. Form the finished dough into a thick rectangle. Wrap in plastic wrap. Chill for at least 30 minutes.